The WLS-501 is a combination of power supply and a lighting lamp, suitable to be used in places without electricity and / or a power supply. There is no need for maintenance or management and it offers automatic control. The WLS-501 is a combination of power supply and a lighting lamp, suitable for use in places without electricity. There is no need for maintenance or management and it offers automatic control. This product can continuously operate for 5 days without any sunlight. The units light source consists of external long life LEDs, to ensure maximum life of the product with an output of 2000candelas (flashing unit). This product uses a standardised design, with the advantages of shockproof and corrosion resistance. It consists of an aviation light, controller, silicon solar panel and a battery. This product complies with both ICAO (Annex 14) and FAA standards. 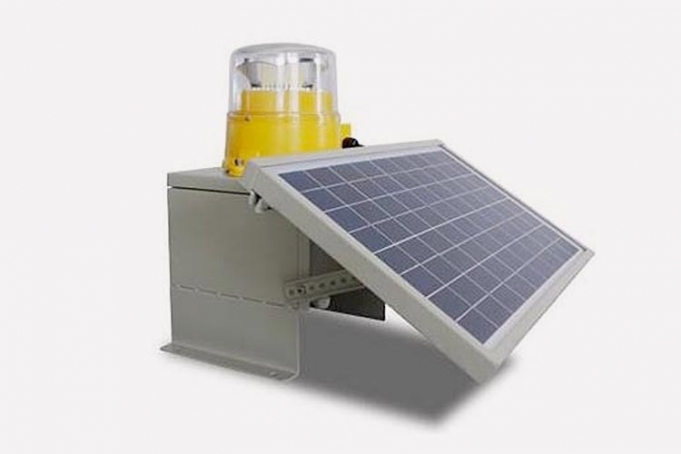 The enclosure of this light is made of die casting aluminium (LM6) with a powder coated finish. Its key advantages are that it is lightweight, waterproof, shockproof and corrosion resistant. The battery enclosure is made of cold rolled steel, and its light source consists of highly luminous long life LEDs. The optical decay does not exceed 30%. This lamp has a built-in controller, a Multipoint Control Unit (MCU), that allows the lamp to manage fault detecting, circuit-measuring, circuit-protecting, circuit-monitoring and solar system protecting. The built-in battery is a long life maintenance free solid battery. The light is also equipped with a special mounting bracket, which is convenient to install and disassemble.